The FreeMotion EPIC Leg Press targets the muscles of the upper legs to assist the user in activities like hiking and running. The movement pattern is arc shaped and allows the body of the user to be fully extended. The leg assembly can be set in one of ten start positions to fit quite a wide variety of users. The user simply pulls the platform forward or presses the pedal to release for a more precise fit. Very easy one handed adjustments can be made whilst seated on the machine. The backrest may be positioned upright for emphasis on the quadriceps and hamstrings or in a reclined position to target the glutes and hip extensors. The platform is textured to prevent the foot of the user from slipping and is contoured to maintain proper foot alignment in various positions. The heavy duty, one quarter inch cable is rated to 4,200 lbs. minimum tensile strength. The two inch wide by 0.125 inch thick belt is rated to 10,000 lbs. The oval shaped weight stack is enclosed to limit access to moving parts. For added safety and security, the equipment can be bolted to the floor. The molded rubber floor protectors guard against damaging the floor. The weight stack access panel allows for simple and convenient cable service whilst the removable upholstery and Linex® wear guards increase cushion life and allow for easy replacement of worn items. 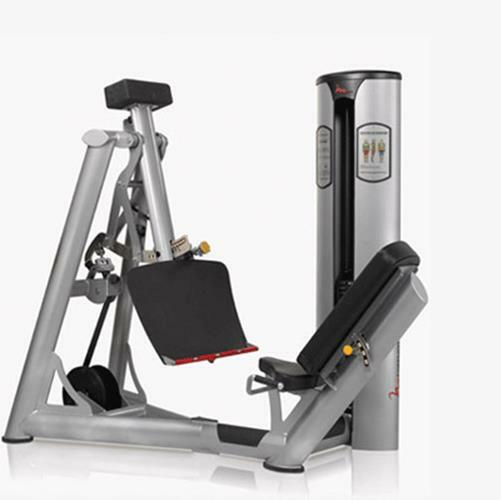 Buy Freemotion Epic Leg Press online. If you are interested in the Freemotion Epic Leg Press for sale, feel free to enquire above.